A new composting initiative in Worthington, Ohio is helping reduce the amount of food waste in the Columbus area. 4Patriots commends this effort while offering survival food good for 25 years. Nashville, TN , United States - March 22, 2019 /MarketersMedia/ — American families throw out approximately 25 percent of the food they buy. That comes to between $1,365 and $2,275 annually in waste for the average family of four. Careful planning, freezing portions for future use and canning are good ways to save on waste and money. Another way is to put food scraps to good use. According to the Columbus (Ohio) Dispatch, local composting partnerships have been formed that keep food waste away from landfills and improve soil for growing additional food. While cooking or cleaning up after meals, participants collect their food scraps and place them in five-gallon buckets lined with compostable bags. Once a week they drop off those bags at designated areas. Then a recycling company specializing in composting picks up the waste and composts it off-site. “Food waste is a very serious problem in America, and it’s great to see several agencies in Ohio stepping up to do something constructive about it,” said Allen Baler, Partner at 4Patriots LLC. Baler’s company provides a variety of products to help people become more self-reliant and independent, including 4Patriots Survival Food. Nearly every 4Patriots Survival Food item – for breakfast, lunch, dinner and snacks – is good for 25 years, so it’s not necessary to periodically rotate stockpiles. All 4Patriots Survival Food items are non-GMO, mostly sourced from the “fresh produce” category and packed in the U.S. The food is dehydrated at its peak of freshness, using a patented $450,000 machine. 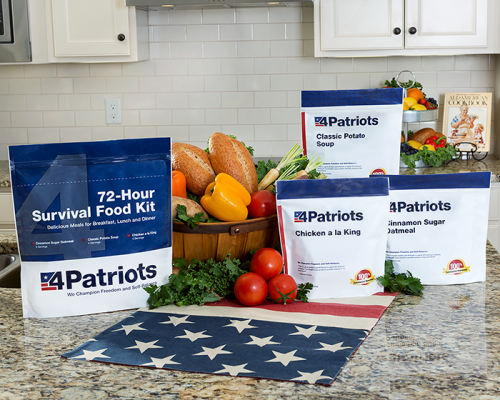 The 72-hour, one-week, four-week, three-month and one-year emergency food kits from 4Patriots are good tasting and nutritious. The food in 4Patriots Survival Food kits can be prepared in less than 20 minutes and requires only boiling water. It’s contained in easy-to-store, space-age Mylar pouches, which keep out air, moisture and light. They are tucked inside tough, stackable totes that are discreet and store anywhere, including the basement, attic, garage, cabin or even an RV. 4Patriots Survival Food provides emergency food products that are shelf-stable for 25 years. All of the meals are made without any genetically-modified products, preservatives or fillers. The kits are available in 72-hour, one-week, four-week, three-month and one-year supplies.